Did The Silver Bubble Burst? Gold bugs argue that Gold is far from being a Bubble. 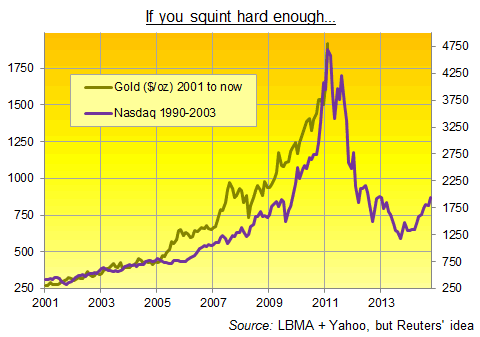 Especially not when you look at the following comparison, which plots Gold’s rise versus the Nasdaq’s rise in the 1990's. I like comparisons because – although history doesn’t repeat exactly – I think it rhymes, and when I look at both charts seperately, I think both are very nice. However, what if the Bulls are comparing the wrong asset to the Nasdaq Bubble? What if they should rather look at Silver prices? Back in April, I felt silver was a Bubble, as price was going VERTICAL, which (as all good things) never lasts forever. 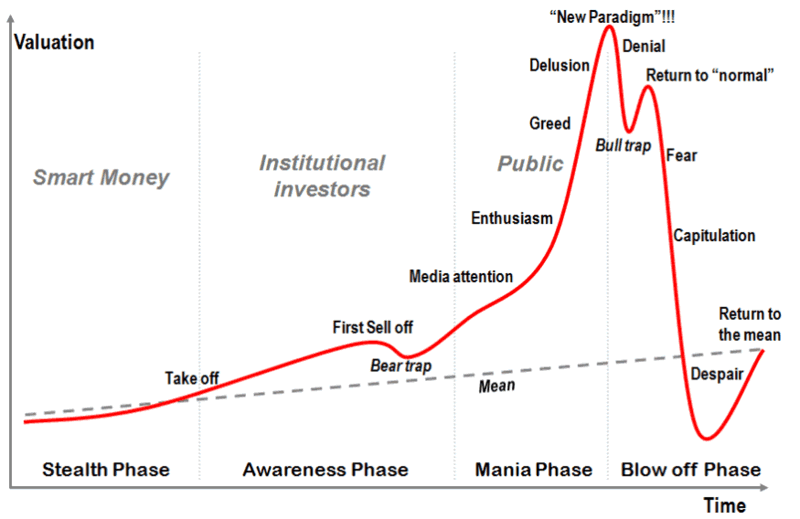 The parabola burst in April, and usually, it takes a LONG time before the next move up will start (if it ever will). Now how is that related to the Nasdaq Bubble? Let’s first look at how most (if not ALL) bubbles evolve. * First, the Smart money comes in. They buy it because it’s undervalued, and they see a lot of potential. The markets are not aware of this. * Second comes the insitutional money. The institutional investors are now also aware that the asset has a lot of potential. After the nice run up, price corrects. Everybody says: this is the end of the bull market, but actually it’s a bear trap. * When price resumes its uptrend, then comes the public: “look at what this asset has done over the last couple of years, it can definitely go higher”. It starts with enthusiasm, then comes greed and eventually, we get a “New Paradigm”: Look at fundamentals, this is a 10 bagger from this point (forgetting that it already rose 10-fold). Then the markets drop. The bulls say that it’s just a temporary correction after the huge run up over the last couple of years. Then the markets rise again. The bulls will say: You see, the bull market has resumed. This is the Bull Trap. When suddenly price falls below the previous low, the chartists get scared, and stoplosses are being hit. More selling follows. Now everybody panics. Then they capitulate: “I’ve had enough of this. I’m sick of it, I’m out”. Usually, price drops too much, too fast. Eventually, price returns back to the mean. 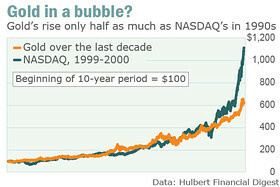 In fact, the Nasdaq is not the only “Bubble” of recent times that has burst. Think about the Chinese stock markets for example, hereby represented by FXI (iShares China 25 ETF). Do you see how similar FXI behaved to the NASDAQ (even AFTER the bubble had burst)? We might now get the “Bull Trap”, which means Silver might rise back towards $37-$39. When price hits that level, and then turns down, the last phase of this Bubble can start: Capitulation. 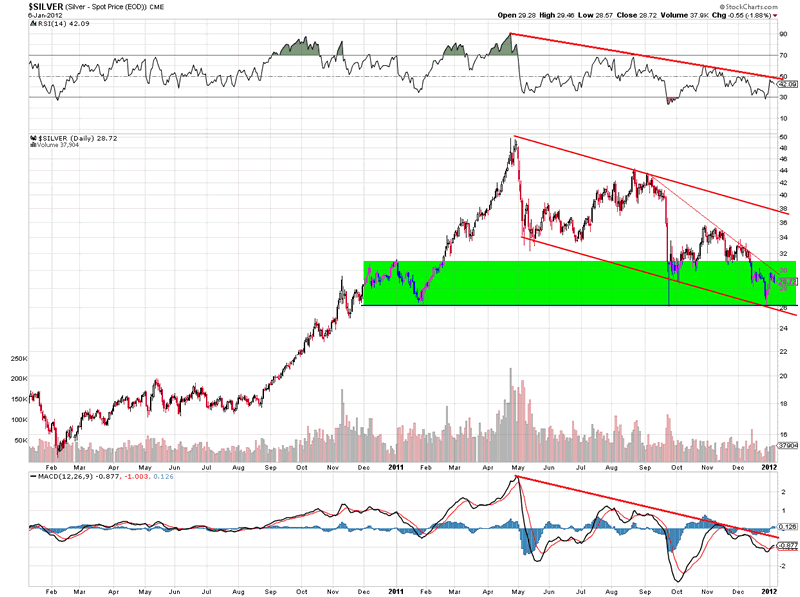 There is one sector which I believe is at or very close to forming a “post-Bubble” bottom. Looking at the gold bubble in the 70's you could have made the same argument when gold retraced from approximately $200 t0 $100 before going $850. I think more important is to see who is participating in Gold. Large funds like pension fund do not yet participate in gold ( with about 0.3% exposure). Also, go out on the street and ask 10 random people if they bought gold in the past 2 years or see if they can mention 3 gold mining stocks. Looking back to the tech bubble or housing bubble - EVERYBODY could tell you the next great stock pick or the appreciation of their newly purchased property. In the 70's gold had a 32 times price increase (from approx. $35 - $850). In this current bull market gold so far only had an approx. 8 time increase (from approx. $250 - $1930). Although silver has more industrial use than gold, if the gold bull market is not over yet, the silver bull market is not yet over EITHER! lol you are saying the bubble burst yet this has happened 3 times before to silver in 04,06, and 08. exact same pattern too. go check your charts. the party just got started and you are about to leave when the girls cheerleading team shows up with weed and alcohol and a bunch of condoms. however al long as we are looking at bubbles lets take a look at 40 years of blowing up the fiat bubble or the 30 year rally in gov debt. now there is a bubble ready to burst. and when it does where do you think that money is going to go? metals wake up get a life you do this for a living and an amateur silver investor like me can school you with the greatest of ease. i am the realist thinking that fake fairy tale farmville digital zero's and ones printed up out of thin air will go to zero and not silver. you are the the one living in the fairy tale. hindsight is 20/20, make another graph that stops in 08 or 06, they both also went vertical, and "crashed". Also If you rode the "bubble" of gold from 1970 to 1985 and you didn't pick the peak, you still would have made 15x your money. That's not a bubble. The lack of the bubble really bursting has to do with the fact that the money supply increased so dramatically. And that's the fundamentals of why people are investing in gold/silver, and the price is rising. The gold bust is coming. How do we know? Because all of the leading and coinciding economic indicators are up. While the trailing economic indicators are now following suit. It would be insane to bet against the US economic engine at this time. 15 Mar 12, 19:07 What economic indictators are up ? Depending on what numbers you are referencing all you are seeing are numbers going up on inflation. Unemployment isnt improving dont be fooled by U3, look at U6. Consumer confidence isnt rising. The housing market hasnt recovered. Real wages are declining - see FRED data. consumer debt is rising again which isnt a sign that people are spending but that they are using credit just to live. There is no US economic engine, only money printing and creative accounting. I unfortunately have to agree. US GDP counts govt spending as GDP so we are counting borrowed and printed money as US GDP. The strong economic driver is Ben Bernanke's willingness to print money. People are too easily fooled by rising numbers such as the DOW. Its not rising value , its rising inflation, its excess liquidity, it is dollar devaluation.